[Blind Gossip] This smiling man has been in the entertainment industry for more than twenty years. He used to be married to a well-known actress, but he has also achieved fame on his own. While he is definitely musical, Smiley has never been in a band. You might think that he is wearing a mask. Nope. That’s really him. He was definitely NOT in the movie 127 Hours. [Optional] Your favorite thing he has ever done? Took me a while, but the “musical” clue helped – he has been in Broadway musicals. I only know this because a girl I went to high school with worked with him on a musical called Nine. This is probably wrong but the first person I thought of is Bruce Willis. I liked that first Die Hard movie but not much else. Antonio Banderas – was married to Melanie Griffith. Antonio Banderas. Clue: Mask of Zorro. Clues: mask (Mask of Zorro), musical (he was in Evita), married to famous actress (Melanie Griffith). I don’t get the 127 Hours clue. ANTONIO!!! NOOOOOOOOOOOO!!!!!!!!!!!!!!!!!!!!!!!!!!!!!!!!!!!!! ::: weeping uncontrollably at the loss of Mr Bandares’ glorious locks circa Desperado. 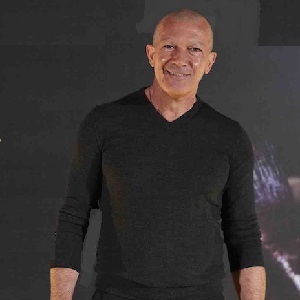 Could it be Antonio Banderas, sans hair and eyebrows? Dios mío, no, no, no! It’s him – he’s just started a new film about the life of Pablo Picasso. Looks like Antonio Banderas to me. Wow, mr. Antonio banderas! What happened?! I thought it was Bruce Willis too! Oh, no, Antonio Banderas, why?